Home › Uncategorized › DUE TO POPULAR DEMAND , All You Can Eat is $37.50 /person…..STILL!! 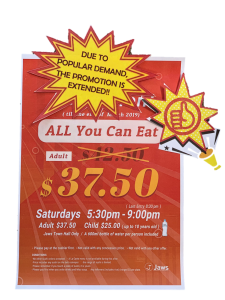 DUE TO POPULAR DEMAND , All You Can Eat is $37.50 /person…..STILL!! Still $37.50/person “All You Can Eat”!! ‹ Jaws Hay St Mall’s HAPPY HOUR Offer on Fridays, too! JAWS BLACK CARD !! NEW TYPE OF LOYALTY PROGRAM!! Copyright © 2019 Jaws Restaurant Group. All Rights Reserved.